[New for 2016] Since Nick lost his camera cable and I can't remember to send him the extra one I have, it looks like I need to review one of the new Ben & Jerry's non-dairy pints on my own. It's not like I didn't want some first hand experience with them anyway. First impressions? I don't like it. It's just odd on the tongue. It looks like ice cream, and feels like ice cream to a certain extent, but it doesn't linger like ice cream. It's like it's there but not there. It's more like frozen product... wait, it tastes like frozen soft serve, that's why it's hitting me weird! The cookies don't really break through the flavor barrier at all though I do get the peanut butter swirl... wow, that is one giant cookie bit, I can't even dig it out. The funny thing is that despite being made of almond milk, I don't think I really taste almonds at all. Because I'm wired very oddly, it almost tastes soapy to me. Some moments are definitely better than others (like when the pb swirl kicks up the texture). A better way to say this is that when I try my son's oat milk, there is this weird... tingle(?) to the way it goes across my tongue. I kind of get that here too. If I was allergic to dairy but not nuts, I bet I would think this is pretty good. Me being me though, I don't think I should review any more of these. I do like when the pb swirl kicks in because then it's the primary taste and texture, but the rest of the time it is just a little too weird for me. I'm not saying it won't work for you, I am stoked for all of our non-dairy friends who are enjoying this, it's just not going to work for me. 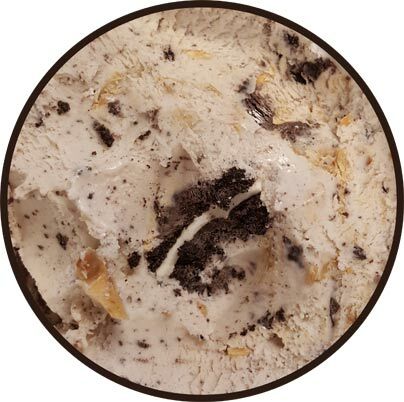 On Second Scoop: (logistics issues, second scoop on Tuesday, so do me a favor and chime in if you've had this already. Did you try one flavor? all four? will you go back for more?) ---- Ok, I finally tried this one again and the secret here is to get a bit of peanut butter on every spoonful. This certainly isn't a terrible product, it definitely has some pluses over some other non-dairy stuff I've tried, but it's just not for me. It's too big a jump from my usual routine. The texture is different, there is an oddness to the taste, and then that oddness becomes more pronounced in the lingering aftertaste. Again, the pb does a good job of cutting in to that and making it seem more familiar, but I just can't imagine making the switch to one of these flavors from my usual dairy filled routine. I was fortunate enough to get a ton of mix-ins (which did cover up some of the weirdness you described that I tasted in other of these B&J's non-dairy ice creams) to make this my favorite of the non-dairy B&J's I've tried, but there are plenty of better B&J flavors available if you aren't bound by a non-dairy restriction (and several better non-dairy alternatives from other companies as well). I might have considered mixing this in my rotation had it had nutrition info comparable to B&J's frozen yogurt, but it's not significantly healthier than normal B&J's. I tried this when it first came out and even paid full price for it at almost $6 and hated it! I drink soy and almond milk and agree with you on the strange texture. I also noticed it freezes really hard and hardly melts which made for a dangerous scooping experience. I will NEVER go back for more! I have a minor allergy to caesin, so I don't eat ice cream as much as I would like (its actually the one dairy thing I will not completely abandon) and I have to say, this flavor is the closest thing I've had that resembles real ice cream. Anyway, I'm rambling but as far as dairy free "ice cream" goes, I've tried everything without coconut and people who have never tried non-dairy "ice cream" understandibly will not like it but overall this one is the closest to the real thing (can't even taste the almond) and the best among non-dairy options. The chunks of cookies and even PB are impressive. Their Chunky Monkey is a close 2nd. Their Chocolate Fudge Brownie is terrible, needs more fat. Or sugar. Or both. Havn't tried their Coffee non-dairy option yet but despite not liking coffee, it seems to pair well with almonds in almond milk "ice creams". 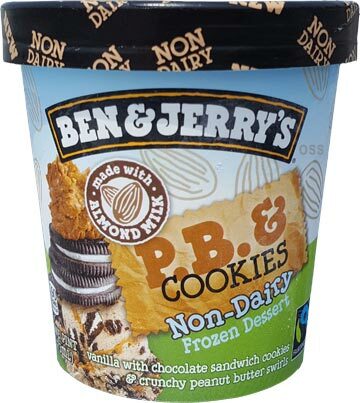 To elaborate on the non-dairy Ben & Jerrys, I like them because they taste just like their dairy counterparts for the most part, which is all I want from non-dairy ice cream. I may actually like the non-dairy Chunky Monkey more than the original. It tastes sweeter, and has a soft aftertexture. 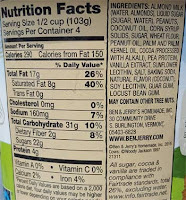 Walnuts & fudge chunks are walnuts & fudge chunks. The non-dairy Chocolate Fudge Brownie is terrible, its virtually 800 calories of bland which in itself is impressive. Needs more sugar and/or fat. And brownies, which need work. The texture and consistency of the brownies are essentially indistinguishable from the base itself so even when you did get some, you ate em without really even realizing it. Real let down. I tried this flavor when it first came out and thought it was awful. The texture was just unbearable and I ended up tossing the pint after a few bites. 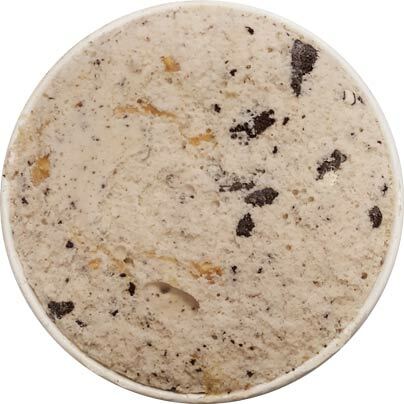 So Delicious cashew milk, especially the snickerdoodle flavor, remains my go-to option for non-dairy ice cream. My experience was similar, but to be blunt, I hated it. The ONLY good thing about the pint was the peanut butter, but the swirls were far too scarce to even justify being half the calories of what it is. I feel like the strange aftertaste comes from the pea protein since I've noticed I don't like things with this in there, but either way it wasn't worth it and even my family agreed it's not something to ever try again (even if it were on sale for fifty cents). This all being said, they did phenomenal on the non-dairy coffee caramel fudge, the only other flavor in this lineup I tried. If you haven't had it, you should review that. Soooo much better and the coffee masked the aftertaste from the pea protein, not to mention how complimentary it was with the faint almond milk flavor. The fudge chunks in this one were dark, complex, and just very enjoyable. It was sweet but slightly gritty and reminded me of a premium chocolate bar. The texture was definitely less of an issue in this pint than the one you reviewed, less chalky. It was just like real ice cream with a more distinct almond flavor present to keep things interesting. I'd love you to do a review of their full dairy free lineup eventually, but from what I've seen the only thing worth getting is the coffee caramel, it was splendid and made me not hate the idea of possibly being vegan (but then I remember other ice cream brands I enjoy and then well, there that goes). It may be blasphemy, but I didn't like it because it has too many and too large pieces of mix-ins. I felt like I was eating a bowl of smashed up cookies. I'm genuinely shocked by the comments. I guess I didn't mind the texture & "chalkiness". 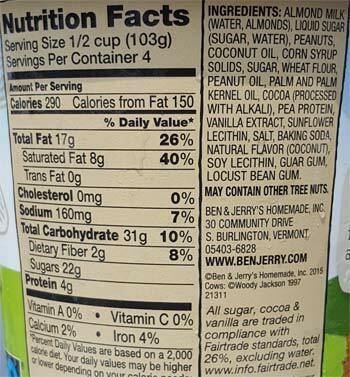 I'm also shocked by the comments as this is one of my favorite Ben and Jerry's flavors ever now. Lots of chucks of delicious cookies and peanut butter swirl. The base is just complimentary to this awesomeness.